Chris Neal is a “native son” of Detroit, Michigan. Born in 1966, Christopher, or Chris, is a mixed media visual artist and began his formal art training at Center (now College) for Creative Studies’ Saturday Workshops as a teenager. He later went on to study Fine Art, African-American Studies, and Women’s Studies at Eastern Michigan University. After completing his undergraduate studies he enrolled in Howard University’s Master’s of Fine Arts program. Chris identifies as a Fluid man of African descent. He began his work in alternative spaces and with marginalized identities within communities of color, initially through his work at the Whitney Museum of American Art, where he taught in a visual arts and literacy collaboration with The Hetrick-Martin Institute’s Harvey Milk High School. 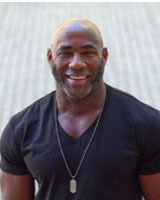 Chris’s work as an artist, educator, and community organizer has focused on re-envisioning the psycho-emotional spaces that black men (men of color) have traditionally occupied – questioning, broadening, and expanding those spaces via a critical investigation of race, culture – with an eye of reimagining the creative and compassionate possibilities within masculinity.